We're back in 2019 with an upgraded PGA DFS Fantasy Golf product. Long-Term Form - How a golfer has been performing over the previous two years. Tweak this variable to give a heavier weight to long-term performance. Long-term performance has been shown to be the most predictive of future performance. Short-Term Form - How a golfer has been performing over the previous two months. Tweak this variable to give a heavier weight to short-term performance. Course History - Tired of getting burned by Luke Donald at the RBC Heritage or Zach Johnson at the John Deere Classic? No problem, if the event is being held at a course where you think course history is critical simply dial up the weighting that week to prop up those golfers in a data-backed environment. Tournament Scoring Average - Defaulted to how the event has played over the previous years, sometimes weather, conditions or renovations can change the scoring environment. Tweak this variable to place added emphasis on fantasy scoring, or finish position bonuses. We are also showing DataGolf's simulations and probabilities, allowing you to view safe cash game plays with a high likelihood to make the cut compared to tournament plays that project well but carry a high degree of variance. Our PGA DFS optimizer supports Fanduel and DraftKings formats including Main Slate and Showdown. The original DataGolf model, simulating thousands of tournaments to determine a golfer's probability of making the cut, or finishing inside certain positions on the leaderboard. Leverage this data to identify safe golfers (high % to make the cut) for cash games, or use it to identify betting opportunities. This is one of the most dynamic optimizers you'll find anywhere for fantasy golf and its experienced a big upgrade in the offseason. Create hundreds of lineups in seconds with our lineup optimizer. Speed - Create teams in seconds based on our projections or your own customized inputs. 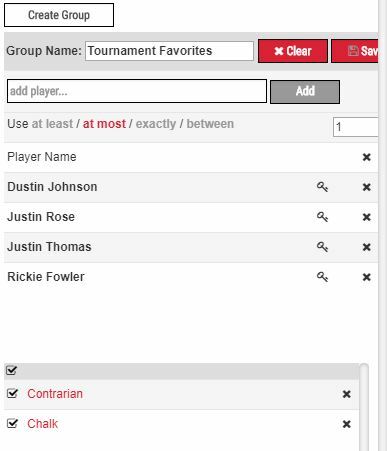 Flexibility - Lock and exclude golfers to come up with your final player pool. Diversity - Use our proprietary shuffle technology to generate a diverse player pool for MME and leverage the unique players per lineup feature to ensure your lineups don't have too much overlap. 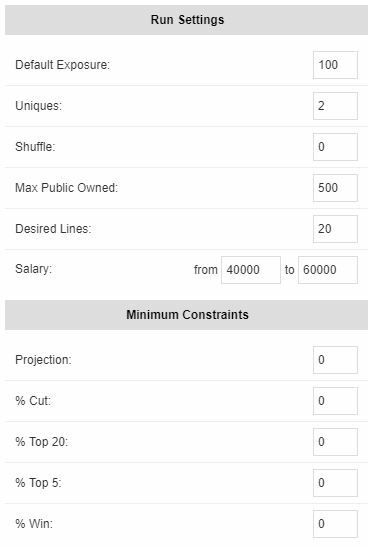 Minimum Constraints - Set minimum constraints for your player pool including odds to make the cut, fantasy projections, Top 20 probability and more. Ownership Constraints - Perfect for tournament players. Ensure that you aren't playing too much chalk or duplicating lineups by optimizing within ownership parameters to create more contrarian tournament teams. Groups - Our groups feature allows you to create custom rules for your player pool. Set configurations to ensure all of your lineups have at least one of the tournament favorites, at most two of the highest owned players, or at least one of your favorite contrarian targets. Create powerful PGA DFS lineups using your own rules. Our 2019 PGA Betting tools are upgraded letting you easily compare our odds to the betting market odds, identifying profitable betting opportunities across a variety of sportsbooks. Our betting tools will support multiple books (Fanduel, MyBookie, Bovada, etc) as well as betting markets (Outrights, Top 5, Top 10, Top 20). We'll also be upgrading our 3-Ball and Head-to-Head betting tools which include custom matchup simulators for 1 or 4 round contests. We don't just project probabilities and fantasy performance, we also project ownership for tournaments on DraftKings. Leveraging ownership projections and fantasy projections is critical for tournament players to identify high-upside, low owned players to create leverage on your opponents. Our ownership projections also let you identify “chalk” helping understand the decisions your opponents are making. Love diving into the stats? Our strokes gained research tools will provide you with everything you need to dive into. Course History - Find out how golfers have performed at different courses. Our course history research tools provide the most advanced look at course history including not just finishing position but what strokes gained metrics lead to the success of the leaders. Use this data to help identify which golfers played well tee-to-green versus putted well, and which key stats were consistent amongst leaders. 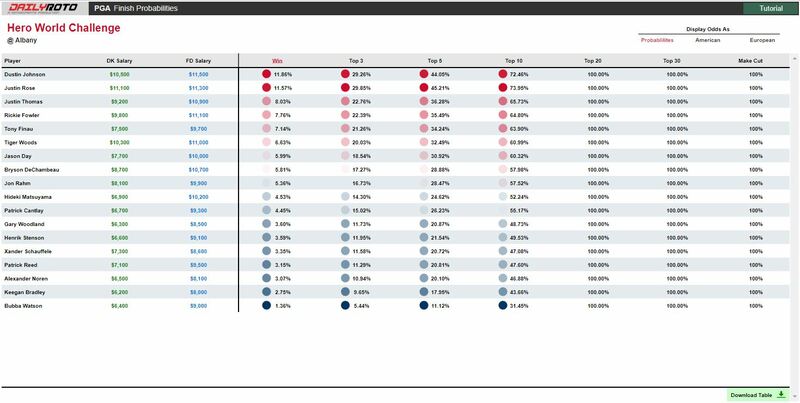 Strokes Gained Trends - Dive into a golfer's trends leading up to an event with our strokes gained trends data. Analyze which players in the field have been consistent in key metrics like strokes gained off-the-tee, strokes gained approach, strokes gained around the green and strokes gained putting. We don't just give you quantitative data, we also help break down each event in our PGA Pro Tip that goes beyond the numbers. Read our articles where we discuss strategy, projections and qualitative takes on this week's event that may not be captured by data models. Each week we'll break down the event via our podcast on the FNTSY Radio Network. Join our community slack channel to chat with our contributors and get to know other like-minded DFS minds. Our slack channels provide a forum to bounce around strategy ideas, discuss plays and sweat the games. Pats on the back when you win, and if you lose, well is better than tilting alone! 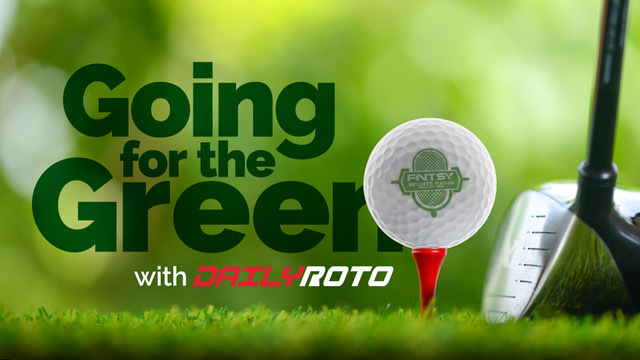 The 2019 PGA DFS product t will cost just $24.99/month, but you can get 4-months for free when you lock in the seasonal package for just $199.99. But that is not all, if you purchase today you can enjoy an additional 10% off with the promo code GOLF19. That is just $179.99 for 12-months of premium fantasy golf projections and content!